This past weekend my daughter and I went for our inaugural skate of the season. We were both very excited. 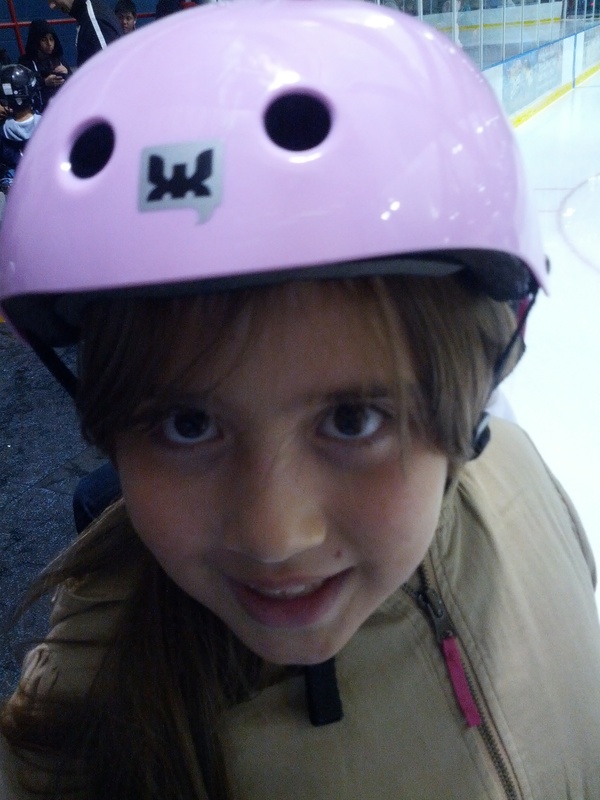 She outgrew her skates from last year, so on Saturday afternoon we went to buy her a new pair. 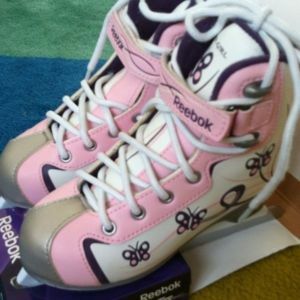 Really cute pair too – pink with flowers on them. That night, we grabbed her helmet and off to the arena we went. When we arrived we joined the massive line of people waiting to get their skates sharpened. My daughter was so excited to get onto the ice, she was bouncing around as if she had ants in her pants. But it wasn’t just her. I too couldn’t wait to get onto the ice, feel the smoothness underfoot, the cool breeze on my face, and hear the scraping sounds all around. This was going to be a great night! After about twenty minutes we finally had our newly sharpened skates and off to the stands we went to put then on. Just then the Zamboni came out to clear the ice. My daughter started complaining that we had to wait even longer to skate, but I explained – how great this was! We get to skate on freshly smooth ice! I couldn’t believe that it was possible for her to get even more excited. Finally, we got onto the ice. We skated to the kiddy section and I began teaching my daughter to skate again as she was a bit rusty (she hadn’t skated since early this year). She was doing quite well when suddenly she fell. No big deal, I thought until then she started crying. She has fallen plenty of times in the past. She pointed out that her pants tore at the knee, and I said it’s OK, we’ll fix them. Then I hear “Mommy, I think I’m bleeding”. I looked down, moved the opening of her pant leg over and immediately thought “Oh sh*t. She’s going to need stitches.” I brought her to the first aid area, and was hoping that I was just over-reacting, but the arena worker did say she would need to go to the hospital. I wasn’t worried about the stitches Per Se. I was worried about how the heck I would get her to the hospital. My daughter had a horrible experience at the local children’s hospital this year and since then, every time I’ve had to bring her back, or to anyone who wears some type of medical uniform she has freaked out. 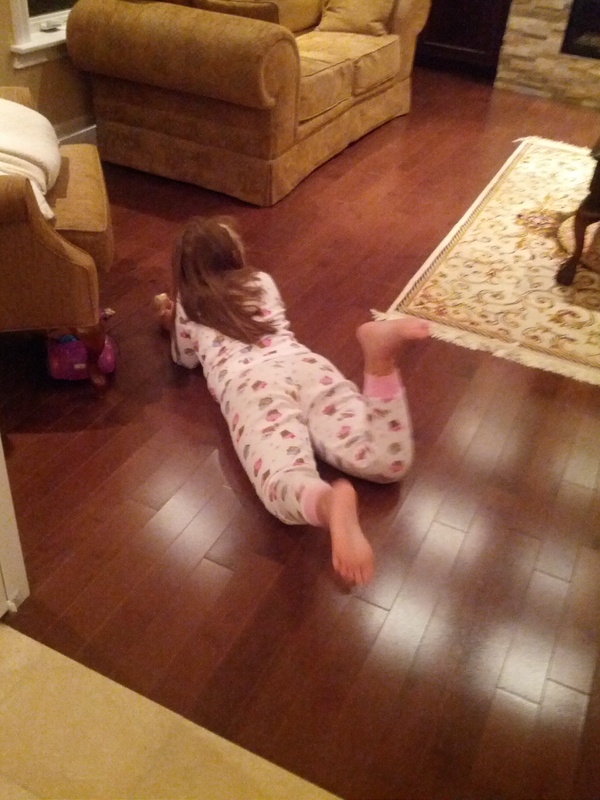 She transforms into a screaming, arm and leg flaying little monster who is inconsolable. And freak out she did. Large. 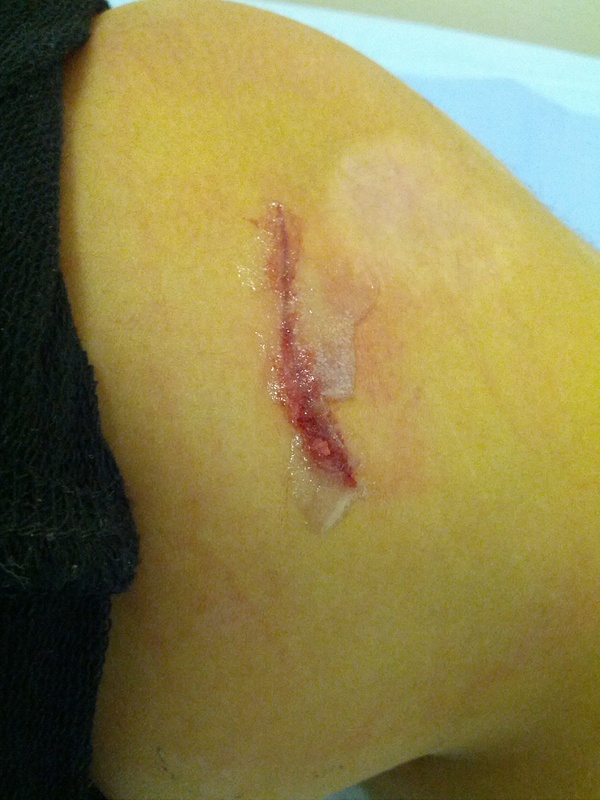 Luckily, she didn’t need stitches, but they did glue her wound together. The poor doctor’s hand was shaking while he was trying to administer the glue, and I was holding her down. Once it was all done, I was told how to care for it once we get home. So last night I had to wipe off the glue, but it was impossible to do. There was so much glue on her leg, way more than necessary. Of course, I understand how that happened. The poor doctor just wanted to finish tending to her. And unfortunately, trying to wipe off all the excess was like trying to wipe permanent marker off the wall. It was next to impossible. So into a warm bath my daughter went, with hopes that glue would soften, or her skin would shrivel allowing for the glue to easily come off. That was wishful thinking. I then slowly started to peel the glue off when she stopped me because it hurt. Of course it hurt! It was hurting me just as much doing that to her as it was hurting her! She insisted that she wanted to do it. I thought, OK, go for it kid. She would slowly lift the sides of the glue up from her skin. I could see the determination mixed with pain on her face. She was breathing heavily as she was concentrating on what she was doing. Then she said “Mommy, can you get me some scissors so I can cut it?” I said, no way. Then she said “please? At least this way there isn’t a lot to lift up.” What a genius idea. So I sterilized baby scissors and I gave them to her. So little by little she would peel back the glue, cut the piece off, put her leg back into the water to soften some more and then proceed again. We were at this for over an hour, but she amazingly got the mission accomplished. All the while, I knelt by the edge of the tub, supervising, cheering her on. What an amazing sight! a lesson that my six-year just taught me. There will be pain that we will experience in life. Rather than letting it just happen to us, why not take life by the horns and do something about it. By acting, the pain will still be there, but it won’t hurt as much because we’ll be concentrating on doing something about it. As I’ve mentioned this before in previous posts, I remain in awe with the lessons that my daughter has been teaching me since her birth. She has been instrumental in my growth process and has been a source of inspiration. I believe that if we are open to learning, that every situation offers an opportunity which something can be gained. Especially if the lesson is beginning taught from those little munchkins also known as kids.